Landon Edwards, a deputy in the Adair County PVA office, received the Teri Bennett ExCel Deputy of the Year award at the annual PVA Summer Conference in Covington, KY. 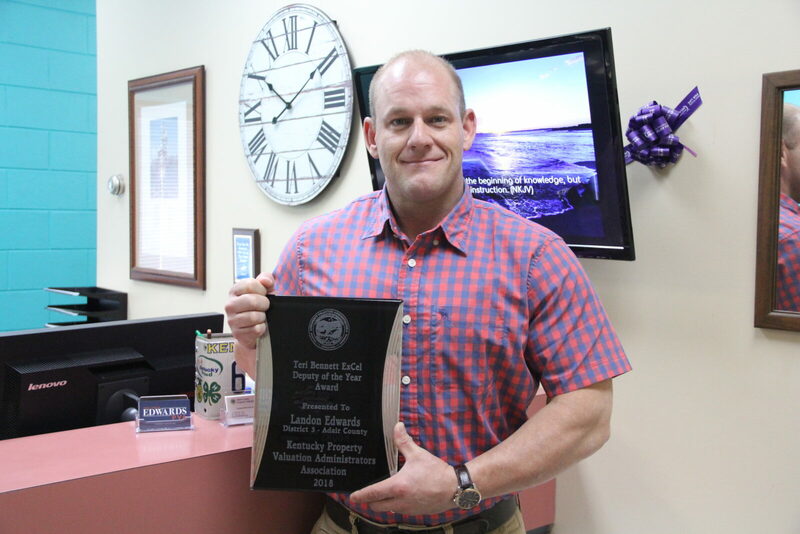 The awards ceremony was hosted by the Kentucky Property Valuation Administrators Association and the Department of Revenue on Wednesday June 6th, 2018. The Bennett award is given yearly to the PVA deputy who displays outstanding service to their county office in all areas while working tirelessly for the taxpayers of their county. Mr. Edwards is a native of Adair County and has been with the PVA Office for 11+ years. He is the son of Tommy and Sharon Edwards, and the husband of Dana Brockman Edwards. Congratulations Landon on this tremendous honor!